Dog eye complaints are common place in a vets consulting room. This is largely due to the vast array of eye complaints dogs can suffer from. All breeds of dogs, and at any age, can be affected with many types of eye problems, each with differing forms of severity. 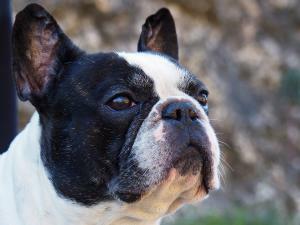 Although, certain dog breeds are more prone to different eye conditions than others. Characterised by cloudiness or whitening of the usually clear lens in the eye leading to impaired vision or blindness. There are a number of causal factors for cataracts such as genetics, age, trauma, inflammation or underlying disease. Diabetes is one of the most common causes of cataracts which is why it is important not to allow your pet to become overweight. Exercise and a correctly balanced diet can help to reduce diabetes and thus cataracts. Once cataracts have formed there is no medical treatment available. The only option is surgical removal which is often not viable. The most common causes for a corneal ulcer (damage to epithelium of the eye) are scratches or foreign bodies. However infection, disease or ingrowing eyelids can also be causal factors. Diagnosis involves applying flourescein, a flourescent green dye to the eye, which highlights the affected area.Treatment for ulcers includes anti-inflammatories, antibiotic eye drops and sometimes serum drops into the eye. This is an inherited disease where the eyelids and eyelashes are rolled in towards the eye ball. Breeds susceptible to entropion are Labrador, Chow Chow, English Bulldog, Irish setter, St. Bernard, Great Dane and Chinese Shar-Pei. The rim of the eyelid is often not visible and the eyes tend to be red, sore and inflammed. The eyelashes rub against the eye ball often causing ulcers. Treatment for this condition is with surgical correction and usually is successful. Since this condition is hereditary it is not advisable to breed from dogs with ingrowing eyelashes. Characterised as a protrusion of the third eyelid from the inside corner of the eye as a red, fleshy mass. Breeds most likely to be affected by this condition are Basset Hounds, Beagles, Bulldogs, Chihuahuas, and the Cocker Spaniels. It is caused by a defect in the retinaculum which is responsible for anchoring the gland down. It is sometimes successfully treated with antibiotic and steroid drops however surgery is usually required. The third eyelid is retained where possible and anchored back down since it is responsible for tear production. Essentially meaning inflammation of the conjunctival membranes. The inner surface of the eyelids appear red, sore and inflammed with a resulting discharge from the eyes. It is caused most commonly by infection or allergies. Treatment usually consists of flushing out the eye and giving antibiotic and/or steroid eye drops once your vet is happy that there is no ulcer or scratch on the eye. Glaucoma is defined by high pressure in the eye. High pressure in the eye occurs when the normal outflow of fluid in the eye is impaired due to a primary eye disease such as the improper development of the eye's filtration angles, or secondary to other eye diseases such as primary lens luxation (slipping of the lens in the eye), inflammation of the tissues of the eye, eye tumour, or blood collection in the front of the eye from injury. Eventually it can cause permanent damage to the optic nerve causing blindness. There is no cure for glaucoma although medication can be given in order to control it. In some cases, surgery may be deemed necessary. My Border Collie was diagnosed with Pannus or Chronic Superficial Keratitis at the age of 2. I first noticed white spots in her eyes which were fatty deposits caused by the Pannus. She has to have eye drops for the rest of her life and wears eye protection in the summer. She is only 5 now so we will do a we can to protect her eyes. My mini dachshund was diagnosed as diabetic 3years ago,he got cataracts in both eyes and went blind within 4months,he was only 5.my vet recommended a great vet who checked if he was suitable for surgery,thankfully he was.He is now 8 and can see very well....This is why insurance is so important for specific pedigrees of dogs.cIty had him on a lifetime policy....company paid.Â£1600 per eye. Surprised you didn't mention dry eye - very common in my breed of Cavaliers. It can be diagnosed with a very simple (and cheap) test done by your vet, and if caught early can be easily treated with lifelong medication. But if not diagnosed early, dry eye can do a great deal of damage to the eyes and be very painful.